Would you like to convert the audio on your computer to WAV format, including the odds and ends, different formats, different volume and sound quality? Extract audio from video files? Or do you think it would be too much hassle? Think again! Easy WAV converter will make the whole process as easy as 1, 2, 3! Step 1: get your audio/ video files and let’s get started! Easy WAV Converter lets you process mp3, mp4, m4a, wav, aiff, caf, mp2, mp1, aac, au, m4r, ts, mov, qt, mpg, 3gp, ac3, m4v, bwf, 3gt, vob, amr, 3ga, awb, au, snd, adts and m4b formats. You can convert an unlimited number of files simultaneously, so drop as many files as you want into the app window. You can play any of the files before you convert them using an embedded player, to give you an idea of what improvements you want to make to those files (e.g. sound quality, stereo or mono track channel etc.) If you accidentally dropped a wrong file into the app, you can remove it with one click. Step 2: If you want to customize your results, go to Settings. You can set the Sample Rate from Voice Quality to Studio Quality and anything in between. Adjust Bits per Sample and Channels. Choose between various Source/Destination settings and what you want the app to do after it completed converting your files to WAV (“After Conversion” options). Choose between Play Sound, designating and opening the destination folder for your converted files. Or, if you want to play around with different settings and files, clear the list and start over! And now, the easiest step of them all: press Convert and experience your files in WAV! 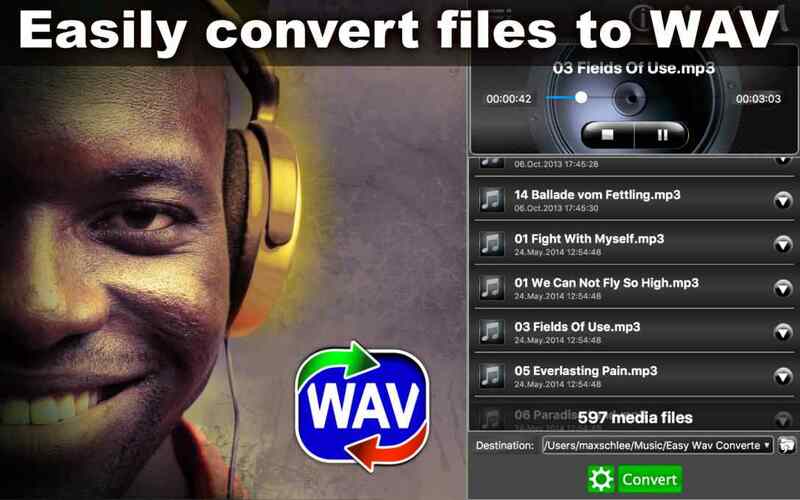 Download Easy WAV Converter now and enjoy the really, really easy way to convert audio files! The free version of this app you can WATCH here! Hello and welcome to Easy WAV Converter. 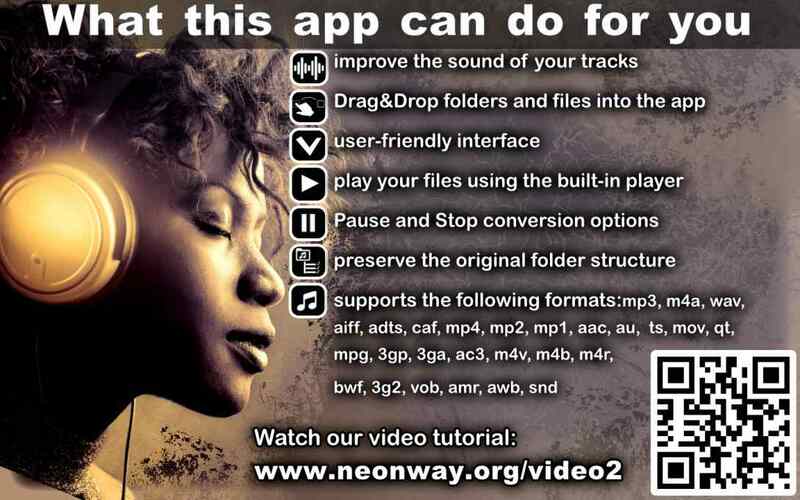 This app will convert your audio files of different formats to WAV, with professional sound quality. It supports over 28 different audio formats, such as mp3, mpg, aiff and more. For a full list of supported formats, see app description. You can also extract audio from video files, such as mp4. The great thing about Easy WAV Converter is that it doesn’t matter if your audio files are all in different formats, of different sound quality, or recorded at different volume. Just load them into the app window, and the app will convert them all to WAV format. So, let’s Drag & Drop our audio files into the app window. You can load just one file, or batches of files, as many as you want. Would you like to play your files before you convert them? Easy WAV Converter comes with an embedded player. Just click the Play button next to the file you want to hear. Dropped a wrong file into the app window? Remove it with few click! You can change the destination folder for your converted files! For customized results, let’s explore the options in Settings. You can customize the sound quality, from voice (low) to professional and studio (high) quality. 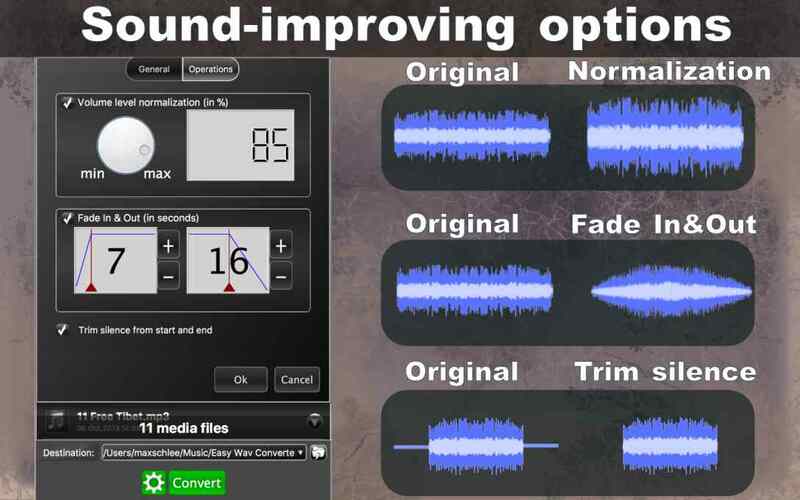 You can also adjust sound channels and bits per sample. Easy WAV Converter also offers Source and Destinations options as well as After Conversion options. If your audio files have originally been recorded at different volume, you can normalize the volume level. You can also add the Fade in & out and trim the silent pauses between tracks. All set? 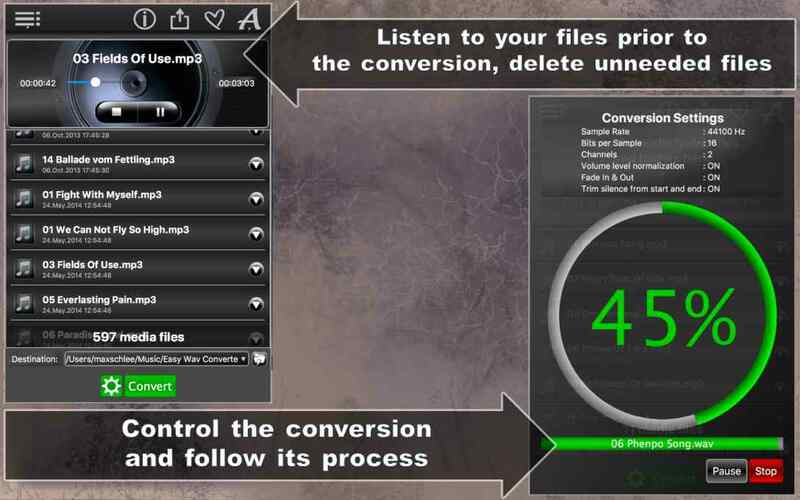 Click Convert and let Easy WAV Converter do the heavy lifting! Here are you new WAV files! Yes, it really is that easy! Download Easy WAV Converter now and experience it for yourself!